4. A War Without End... Amen. Senate combine elements of Thrash, Black, and Melodic Metal to forge an ultra-aggressive, hook-laden style of their own. Their style includes Norwegian Black Metal-inspired vocals over thrashy guitar riffs. 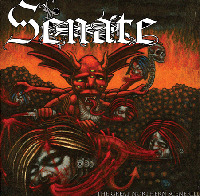 Senate is comprised of Matt Difranco - Vocals, Jay Siebert - Lead Guitar, Hudson - Rythmn Guitar, Colin Lernell - Bass Guitar and Patrice Hamelin of the classic Quebec tech metal band Martyr on Drums.